Aum Is All This And Also That Which Is Not All This! It Is The Primordial Self-Resonance That Created All The Cosmoses. It Is Also Pre-primordial through Innumerable PathWays. Om is not a mere word. According to eastern traditions OM is the Word in this Revelation. It Is the Beeja Mantram [Seed Mantram] of All Mantrams [Divine Resonances] and Mownams [ Vast Cosmic Silences ] . "Ometyedakshram idam sarvam ~ tasyopavyaakhyaanam bhootham bhavat bhavshyateti sarvam-omkaara eva ~ yachaanyat trikaalaateetham tadapy-omkaara eva". "OM The Imperishable is All This. In Elucidations the past present future are verily "Om" Itself. If verily there Exists anything other than these three states of Time even that is OM." Om is composed of three Sounds Aa U M. "Aa" represnts the waking state of consciousness. 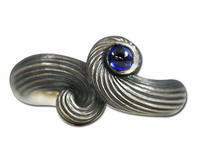 "U" represnts the dream state of consciousness and "M" represents the deep sleep state of Consciousness . "Aum" [OM ]together represents the fourth state of Consciousness called Turiya Avastha when one becomes the Witness of All three states and transcends into Samaadhi[Satori]. OM is used all over in the Vedic Mantrams and Tantric Mantrams too. It Is The Seed Of All. 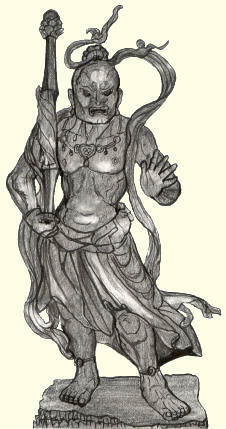 Even Buddhist and Jaina scriptures and teachings accept OM unconditionally. Is the general Mantram used before any auspicious ritual. etc are Mantrams used for meditation and prayer. There are also cassettes with "Om Namo Naaraayanaaya" and "Aum Nama Shivaaya"
etc. recited perpetually resonantly" . Literally, Pranava in Sanskrit means "humming." The mantram Aum denotes God as the Primal Sound. This sound can be heard as the sound of one's own nerve system, and meditators and mystics hear it daily, like the sound made by an electrical transformer or a swarm of bees, or a thousand vinas playing in the distance. It is a strong, inner experience, one that yogis hold with great reverence. The meditator is taught to inwardly transform this sound into the inner light which lights up ones' thoughts, and to bask in this blissful consciousness of light. Pranava is also known as the sound of the nadanadi sakti. Hearing it one draws near to God Consciousness. When we are living in the lower chakras, or when the world too strongly dominates our mind, this sound may, for a time, not be heard. But it returns as awareness withdraws, as the mind becomes perfectly quiescent, silent, still. Listen for this sound in your quietest moments and you will learn to recognize it as a daily encounter with the Divine that lives within all men, within all creatures, within all existence. A deeper insight into this mystic symbol reveals that it is composed of three syllables combined into one, not like a physical mixture but more like a chemical combination. Indeed in Sanskrit the vowel 'o' is constitutionally a diphthong compound of a + u; hence OM is representatively written as AUM. 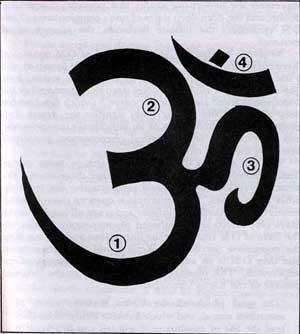 Fittingly, the symbol of AUM consists of three curves (curves 1, 2, and 3), one semicircle (curve 4), and a dot. The large lower curve 1 symbolizes the waking state (jagrat), in this state the consciousness is turned outwards through the gates of the senses. The larger size signifies that this is the most common ('majority') state of the human consciousness. Finally, the semi circle symbolizes maya and separates the dot from the other three curves. Thus it is the illusion of maya that prevents us from the realization of this highest state of bliss. The semi circle is open at the top, and does not touch the dot. This means that this highest state is not affected by maya. Maya only affects the manifested phenomenon. This effect is that of preventing the seeker from reaching his ultimate goal, the realization of the One, all-pervading, unmanifest, Absolute principle. In this manner, the form of OM represents both the unmanifest and the manifest, the noumenon and the phenomenon. 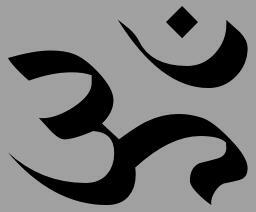 As a sacred sound also, the pronunciation of the three-syllabled AUM is open to a rich logical analysis. A-UN 阿吽　is the Japanese pronunciation; usually we know this sound as the holy mantram OM or AUM. 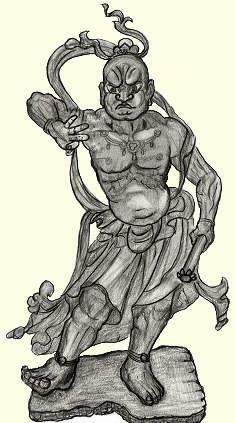 The most famous rendering of A-Un are probably the huge statues of the Nioo-Deities of the gate of the temple Todai-Ji. The statue A has his mouth open, the beginning of all things. The statue UN has his mouth shut, the end of all things. with the two Sanskrit letters for A and Un.
. Temple Jindai-ji 深大寺の達磨市と梵字 . "the first and last; signifies God's eternity"
The fourth Gospel, after stating that the "Word was God", says, "and the Word dwelt among us full of grace and truth". The Great Buddha in Kamakura, Japan, is a sight to behold. There were many butterflies there on the day I first saw the statue.
" 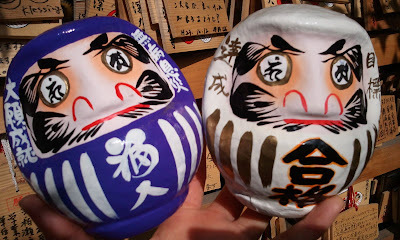 Sound of the mountain" Yasunari Kawabata's Novel. He lived in Kamakura.
. More about the Koma-Inu, Guardian Dogs with A-Un statues in Japan.